There’s something special about the approach of autumn. For me, the feeling is unique to this time of year, and is entirely different than the change over of any of the other seasons. Maybe it’s the promise of relief from the heat of summer with the cooler weather we know is surely on its way. Maybe it’s the return of some much-needed structure as the kids go back to school and resume the routine of their organized activities. Or maybe it’s something far less tangible…the mere glimpse of hope, possibility, and new beginnings I feel waiting in the wings. There’s a special type of magic in the air in September, and the feeling is even more pronounced for me this year than any other. While I may not be able to put my finger on what it is exactly, I know with great certainty change is coming. I can feel it in my bones. It began several weeks ago with a restless ache in my body. What started as little more than a twinge in the pit of my stomach has grown much larger and is taking shape from deep inside. The structure of my cells is being altered as this ‘thing’ takes root in my core. Having wiped away the dust and residue from the stories of the past that previously clouded my vision, I’ve started to see with fresh eyes. I no longer need to be shielded from the truth; no more distortion or protective filters required to paint a more palatable picture of the prevailing reality for my ego self. I think it’s human nature to seek out evidence—a sign, or better yet, some type of actual physical proof—that supports our hypotheses and assertions. It’s normal to want to be able to see, hear, smell, taste, or touch something before we can truly believe in it. But sometimes, before a thing comes to life, before it’s actually manifested in the physical form, you just need to put all of your trust into its becoming. And yet, evidence of change is all around for those who are willing to see it. Watch the leaves show us the wisdom of the natural world, as they change from their deep, glossy greens, to the glorious shades of golds, rusts, and purples. This is the leaves way of demonstrating their trust in the knowledge that their season of life is over and the time has come for them to surrender. Although temporary, the results are remarkably beautiful, even breathtaking to behold. Not long after the beautiful display of fall colours, we also know the trees will shed their leaves to help conserve energy for the winter. The leaves that hang on will, no doubt, be torn from their branches by a swift autumn wind eventually. As evidence of my humanity, on a purely physical level I can see my skin is changing and I’m shedding my hair like mad. I am releasing physical and mental clutter in every corner of my life. I am more committed than ever before to my own evolution and metamorphosis, and at the very least, I continue to become increasingly aware of my actions and reactions. And I suppose that’s how I know with all I am that the time for harvest must surely be nearing. The seeds that were planted within me long, long ago are sprouting with the beginnings of new life. It’s a life that’s bursting with the hope that anything is possible—even really difficult things and maybe even miracles—when I believe and put my faith in the power of love over fear. Through the infinite wisdom of a universe in which everyone and everything is connected to everyone and everything else, I am aware of the change that is occurring, both all around and deep within me. I trust not only in what I can see, but also in the less quantifiable feeling of what has not yet materialized. Like the leaves, I am immersed in the surrender of my own unraveling. As I continue to challenge old beliefs and peel away the protective layers, I’m removing the costumes and masks I’ve worn. This is the real me; exposed and vulnerable. Just being. It’s messy and complicated, and may not look like much on the outside, but when I get very still and quiet I know that a space is being created for something significant to enter. I don’t know what it is yet, but I trust in whatever it will be. 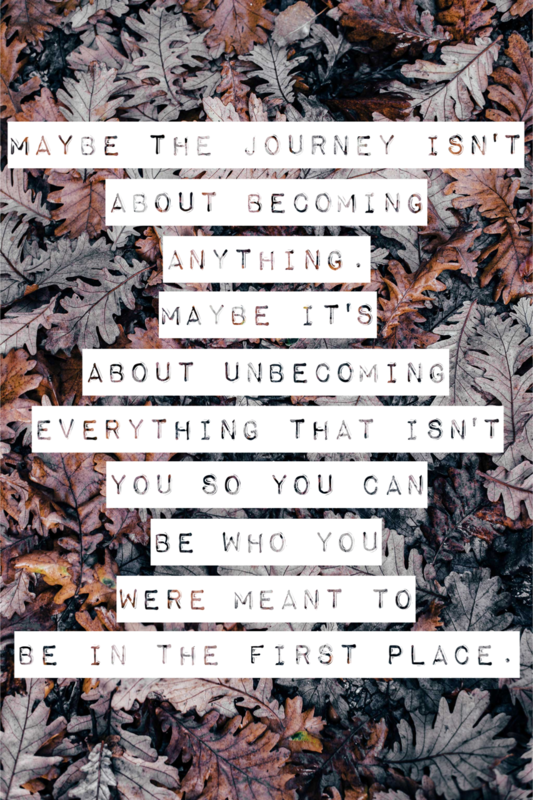 This is the season of my unbecoming.